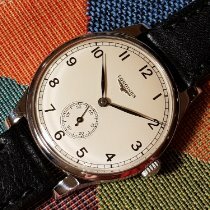 This is a lovely vintage Longines. 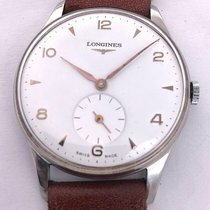 This watch is powered by the beautiful Longines 12.68Z calibre, with beautiful decoration, "chatons" jewel settings: at the time Longines were very much at the high end of the market. Snap on stainless steel case back. 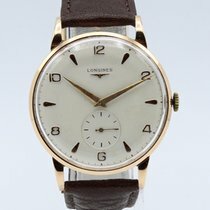 This watch is in very nice vintage condition. The watch keeps good time, and runs with an excellent balance amplitude. 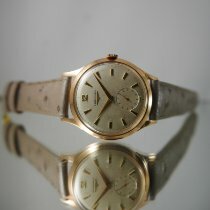 The dial has signs of ageing, however I would say it is still in good original condition, as the ageing is very uniform. Brand new brown leather strap (Italian buffalo Calf leather) with generic stainless steel buckle. 3 Months warranty from the date of sale. Warranty excludes bracelet / strap and any damage caused by water ingress. Olivier Nicolas Watches is a small specialist watch business, selling pre-owned vintage quality watches. You can buy in confidence as we have a straight-forward returns policy for your peace of mind. We also provide a minimum 3 months warranty as standard.